Uglyworld #1435 - Super Bowling Sundays (Project TW - Image 36-366), a photo by www.bazpics.com on Flickr. Firstlies, hello from Oregon everyones!!! We flyereds up from Calimafornia around lunchies timer today, and managereds to gets checkered into Babo's favouriter hotel in alls of Americas. I quickly learneds why Babo likers it so much, the hotels people had leavereds a coolers big note in our roomer sayings "Welcome Back! ", and more importantlies they sorteds me out with nots just one boxer of cookies, buts two of them!!! No sooners had we checkereds in, but there was a knocker at the door, looks who it is, Cookie Chef Babo...!!! Thankfullies he wanteds to hanger around and watches the Super Bowling with me, so we inventereds a coolers game to plays while things is going slowers on the fielder, we calls it "Cookie Flippin'". 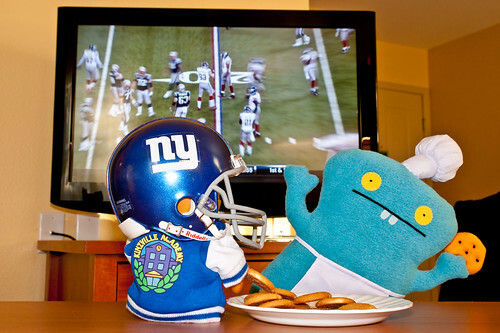 Cookie Chef Babo is reallies good at it, checks it out, "Goes long Babo....", and he catchers another one!! !